IBM DATABASE 2 Universal Database Server for z/OS Version 8 (DB2 V8 throughout this IBM book) is the twelfth and largest release of DB2 for MVS. It brings synergy with the zSeries hardware and exploits the z/OS 64-bit virtual addressing capabilities. DB2 V8 offers data support, application development, and query functionality enhancements for e-business, while building upon the traditional characteristics of availability, exceptional scalability, and performance for the enterprise of choice. The DB2 V8 environment is available only for the z/OS platform, either for brand new installations of DB2, or for migrations exclusively from DB2 UDB for OS/390 and z/OS Version 7 subsystems. DB2 Version 8 has been re-engineered for e-business, with many fundamental changes in architecture and structure. Key improvements enhance scalability, application porting, security architecture, and continuous availability. Management for very large databases is made much easier, while 64-bit virtual storage support makes management simpler and improves scalability and availability. This new version breaks through many old limitations in the definition of DB2 objects, including SQL improvements, schema evolution, longer names for tables and columns, longer SQL statements, enhanced Java and Unicode support, enhanced utilities, more log data sets, and many more advantages. This IBM Redbooks publication introduces the major changes and enhancements made available with DB2 V8. It will help you understand the functions offered by DB2 V8, and provides enough information to start evaluating their applicability to your environment, as well as to start planning for the installation of DB2 V8 or the migration from DB2 V7. 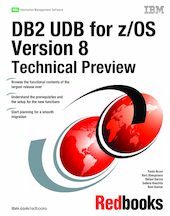 Further information can be found in: DB2 UDB for z/OS Version 8: Everything You Ever Wanted to Know , ... and More, SG24-6079.